The House of Silk is a novel with three parts; a fast-paced beginning, which gives way to a section of inaction, followed by an ending which feels almost ‘tacked on’. I have not read anything by Anthony Horowitz before, but he has accurately replicated Doyle’s writing style and Watson’s voice remains consistent throughout. This initially drew me in and held my attention, but as the novel progressed the weakness of the plot could not be sustained on that alone. There are really two mysteries in this novel, and the attempt to write two novellas in one is where the main weaknesses lie. The first mystery is that of the Flat Capped Gang, brought to the attention of Holmes by Edmund Carstairs, a partner in an art gallery who believes he is being stalked. The art dealer had recently become caught up in gang activity in Boston, after some paintings he had sold were destroyed in a train robbery carried out by the twin brothers who lead the ‘Flat Capped Gang’. Carstairs believes he is being stalked by the surviving leader because of his role in the other brother’s killing by police during a raid.The second mystery gives the book its title ‘The House of Silk’. This mystery is introduced when someone involved in the ‘Flat Capped Gang’ investigation is murdered and found with a single piece of silk tied around their wrist. 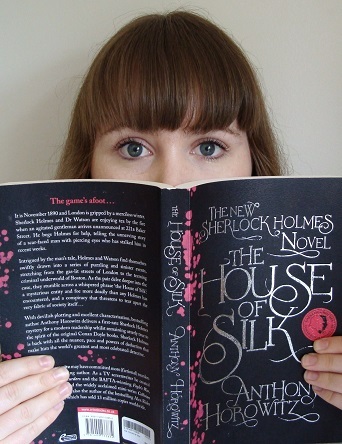 Investigations into the House of Silk are thwarted at every turn. Holmes takes a great many risks throughout the investigation, and uncharacteristically makes a number of grave miscalculations. There was something missing from this novel that I can’t quite put my finger on. Perhaps it was just different in ‘theme’ to the other Holmes stories I have read, which made this particular story feel it was not as wonderful as it could have been. In the end I’m not sure that Sir Arthur Conan Doyle would have approved of the plot. That might sound a little mysterious, but I don’t want to give away too much. If you have not read any of the Sherlock Holmes novels I would recommend you start elsewhere, but fans of Holmes will find something here to enjoy.